[ISRAELI INDEPENDENCE]. Broadside. November 29, 1947. 1 p. 27.5 x 39.5 in. and to the the Jewish Settlement in Israel! Here comes the historical decision that we have hoped for 2,000 years. We will awaken conscience throughout the world. Indeed, we have not yet completely obtained our rightful claim. However, it is our joyful right to swear independence in the State of Israel right now. It was the Israeli resilience, it was our fateful declaration, it was in our government’s resolving mandate, it was in our displacement. It was the plot [for us] to be broken. Two significant, powerful countries- The United States and the Soviet Union, along with the majority of the world’s nations, faithfully protected our right and stood beside us demanding a State of Israel. 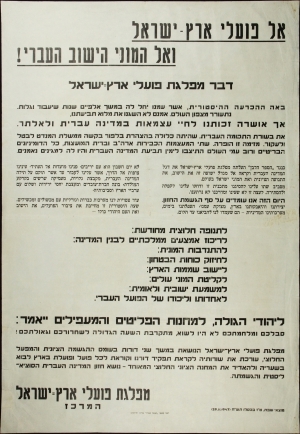 Against the “White Paper” [of 1939], The Worker’s Party of the State of Israel brought immigrants to Israel. The flag [ie flagship?] of the Israeli Government called for the salvation of the Jewish settlement, the Zionist Movement, and the common masses of Israel throughout the whole world. All around were signs for us to withdraw our outlandish plans- they urged us to fold and to neutralize. We were not hostile towards outside council, but we did not flinch from our path. Today we are standing on the threshold of our realized dream. Since the creation of our people and the struggle in our land, our nation has been troubled; we have progressed in the day of our government’s campaign- those who stood against us are convinced. It is not the day to take our opponents into account. We have faced the histories of our past. We were without observers along the way, who were we to go beyond establishing the entirety of the Israeli Government, to gather the Diaspora, to deepen the roots in the soil of our homeland [reference to immigrant’s agricultural work? ], to create the socialized worker, to propose friendly relations and peace with the Arabs of our land and our neighbors. You have not suffered and struggled in vain. We have approached the great hour of your freedom and your emancipation! The Labor Party has carried on for two generations in the dimmed Zionist vision and the pioneering project, managed the ranks in preparation for our generation’s duty and called to all the workers in the land to come and to glorify the camp of the united pioneering Zionists- the issue of the dream [for Israel] the Israeli Government was robbed of that has now been achieved. The Labor Party of Israel. On November 29, 1947, the U.N. General Assembly voted 33 to 13, with 10 abstentions, in favor of the Partition Plan (General Assembly Resolution 181). The division was to take effect on the date of British withdrawal from Palestine. Both the U.S. and U.S.S.R. voted yes. Afghanistan, Cuba, Egypt, Greece, India, Iran, Iraq, Lebanon, Pakistan, Saudi Arabia, Syria, Turkey, and Yemen voted no. Great Britain was one of the abstentions. On thin paper, folded, some creasing and short tears to edges and to folds, small area of spotting, but unusually fine for such a large broadside.